How do I create a Multiple Choice quiz question? 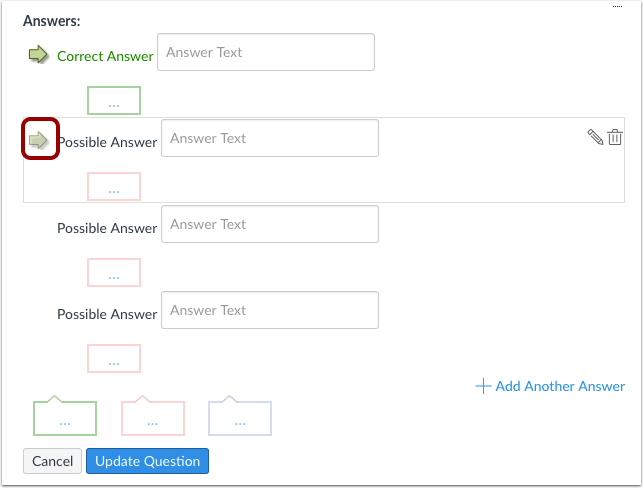 You can create a multiple choice question for your students. 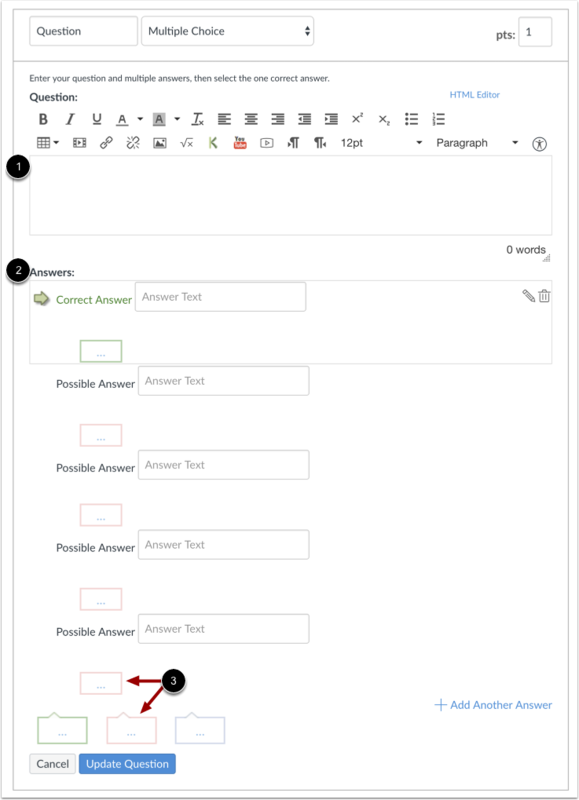 If you need to edit a Multiple Choice question after publishing the quiz, you can use quiz regrade to edit quiz questions and tell Canvas to update grades for students who have already taken the quiz. 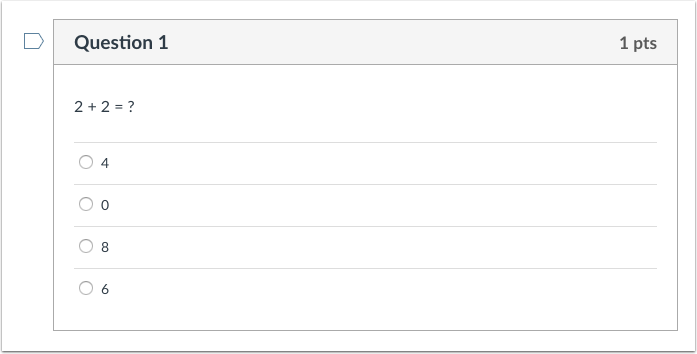 Note: Quiz point values support up to two decimal places. Entering more than two decimal places will round the point value to the nearest hundredth. 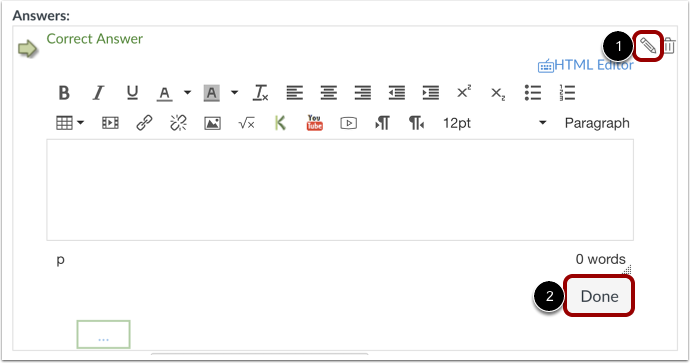 To create your answer with the Rich Content Editor, hover over the response and click the Edit icon . This switch will allow you to post video, audio, math equations, and more in the answer response. Click the Done button when finished . Click the Delete icon  to the right of an answer to delete it. 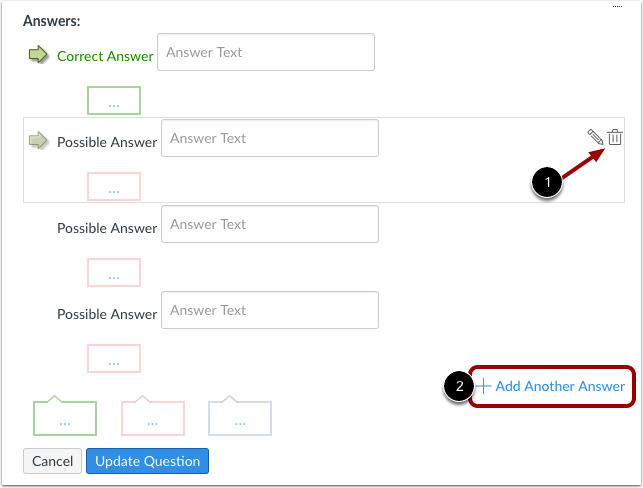 Click the Add Another Answer link  to create as many distractors as you like. Multiple Choice questions can have more than four answers. 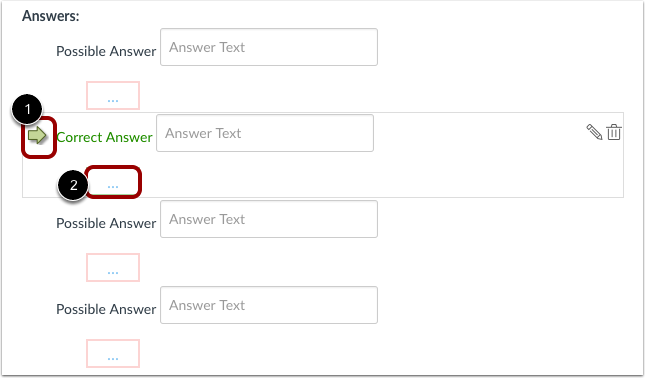 Correct responses are indicated in green, while incorrect responses are in red. 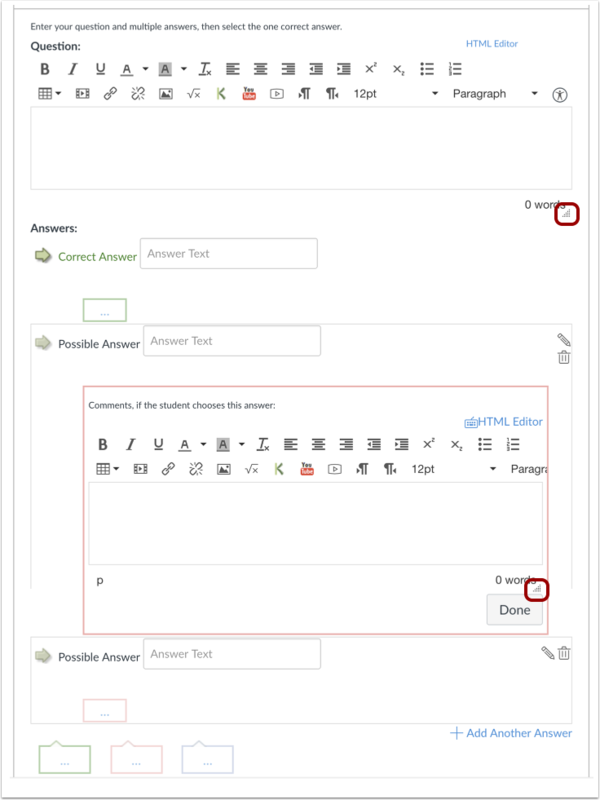 By default, the text in the first answer field is the answer that will be considered correct by Canvas. The correct answer is identified by a solid green arrow  next to the answer, and the answer comment  is also green. To select another response as the correct answer, hover your cursor to the left of the answer you want to reveal a faded green "ghost" arrow. Click the arrow. The arrow will become solid green , and the answer comment  will also turn green to indicate the correct answer has changed. 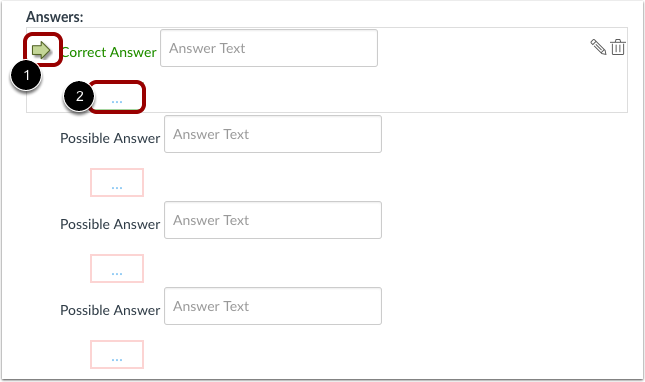 You can also create general answer comments for the quiz question as a whole . 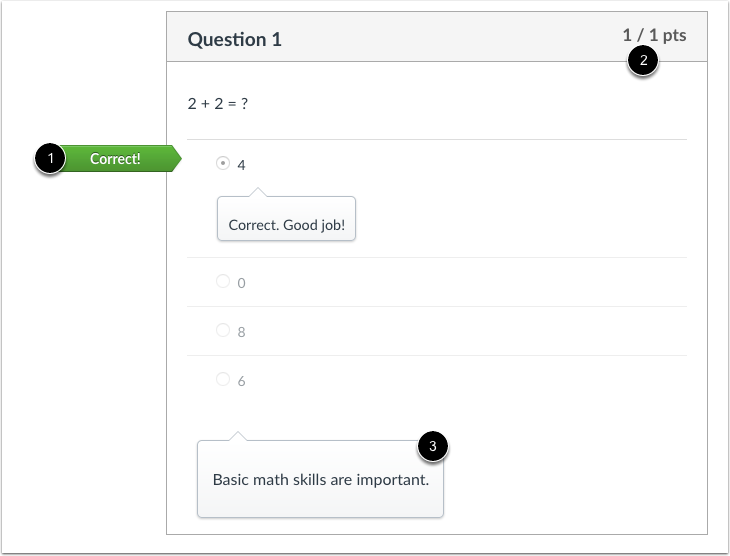 Students who select the correct answer will see the feedback in the green comment field. 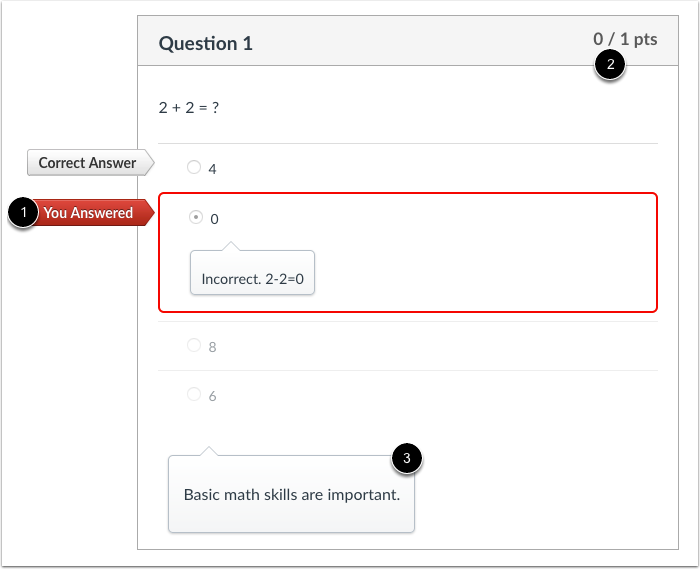 Students who select any incorrect answer will see the feedback in the red comment field. All students will see the feedback in the blue comment field. Note: Any applicable feedback is visible as soon as a quiz is submitted and cannot be hidden from students. Each text box can be expanded in size by clicking and dragging the handle at the bottom-right of the text box. Click the Update Question button. This is what students see when they encounter a Multiple Choice question in a quiz. This is what students see if they are allowed to see correct answers after submitting the quiz. Students can see which response was correct by viewing the green flag . 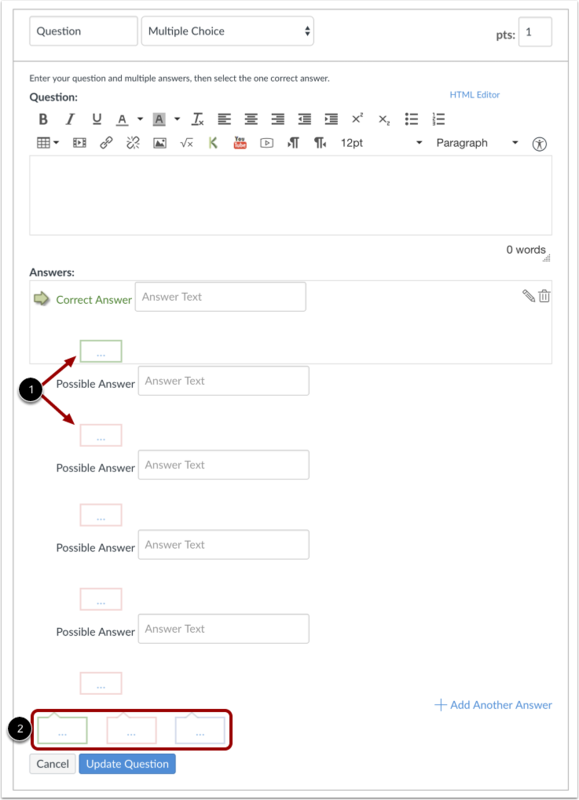 Credit is assigned if the student answers a Multiple Choice question correctly . Notice that the blue answer comment appears whether or not the student answers this question correctly . Students can see which response was incorrect by viewing the red flag . No credit is assigned if the student answers a Multiple Choice question incorrectly . Notice that the blue answer comment appears whether or not the student answers this question correctly . Previous Topic:How do I create a quiz with a question group linked to a question bank? Next Topic:How do I create a True/False quiz question? Table of Contents > Quizzes > How do I create a Multiple Choice quiz question? Re: Does Quizz feedback allow for rendering equations? Re: Is there a way to include insert math equations as answers in quizzes?